— Leonard Cohen, "The Future"
A Bad Future is one of the most common Alternate Timelines and one, who if Time Travel exist in their universe, any stars of a long-running series will surely visit. The heroes are sent into the near future (common intervals are 5, 10, and 20 years), and discover a Crapsack World. Usually the villain(s) have taken over. They may even encounter themselves. 90% of the time the hero(es) will meet La Résistance and/or Future Badass versions of his friends who were left in the past. Typically they go back in time to Set Right What Once Went Wrong. Technically Dystopian, but doesn't fit that trope description well as it's usually ascribable to a single villain-related event. It's a good (or cheap, depending on the execution) way of becoming Darker and Edgier and adding tension while working under Status Quo Is God. If a series gives only a brief glimpse of the Bad Future instead of actually going there, it may be Storyboarding the Apocalypse. If this happens to a character from the past to "our" future, then they've entered a Bad Present. If the reason the bad future is so bad is because The Bad Guy Wins, it's a Villain World. Sometimes the characters find out about the Bad Future via an Ominous Message from the Future rather than Time Travelling themselves. Compare with Future Me Scares Me, Dark World, Techno Dystopia, It's a Wonderful Plot and Mirror Universe. Aladdin: The Series: villain Abis Mal goes back in time, teams up with his own ancestor Abnor Mal, and tries to replace the current sultan's family as founders of Agrabah. Both of them being rather inept however, their plan does not work and is, as always, foiled by Aladdin. Meet the Robinsons, with the alternate future ruled by a robotic bowler hat. Specifically, when the Bowler Hat Guy takes credit for Lewis's Memory Scanner, he unwittingly helps Doris and her demonic, robotic bowler-hat offspring destroy the bubblegum neo-fifties Zeerust future in favor of a dystopian future. Bonus points for a Future Badass mind-controlled Robinson family. You can tell they're Future Badass because all the women wear black lipstick. One of those rare inversions drives the plot of Bill & Ted's Excellent Adventure: the good future is in danger of not happening if Bill and Ted don't get to start their band. Inverted in Hot Tub Time Machine, as the movie starts out in one. Nick works a dead-end job of cleaning dogs' anuses, Jacob lives in his uncle's basement, and Lou's life is so bad, he attempts suicide. At the end of the film, Nick lives his dream of being a musician, Lou becomes a billionaire by exploiting what he knew would happen after the '80s, and Jacob lives with his rich father. 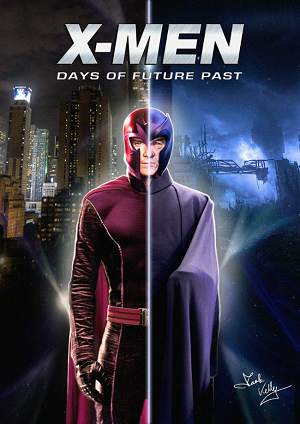 The premise of X-Men: Days of Future Past is preventing a horrific dystopian future by changing past events. Thrill Seekers: After a reporter finds out that tourists from the future are visiting disasters in his own time, he actively seeks to prevent these events. Two agents travel back to stop him from changing anything else. Their boss at one point calls them up from the future which is now overpopulated, polluted, and had bad people get voted into power. Time Runner: In 2022, the Earth is invaded by a race of aliens who have already infiltrated most layers of society by posing as humans. A wormhole allows the hero to go back in time to Set Right What Once Went Wrong. Frodo sees a bad future of the entire Middle Earth conquested by Orcs looking at Galadriel's fountry in Peter Jackson's The Lord of the Rings, this is film only as is not in the books. In Conciencia y Voluntad the future isn't very bright: economical crisis and warfare has bring down most nations, and a catastrophical technological disaster (Massive EMP) get back the technology level at an incertain point between 1950 and 1980, although many of the knowledge is saved. The book features a possible bad future, observed during Aviendha's final tests to become a Wise One. It seems that her descendants become embroiled in a war with the Seanchan Empire, who have acquired gunpowder weapons, conquered Tar Valon and subjugated the rest of the world. Decades or centuries later, the once-proud warrior Aiel have been reduced to scavengers living off the refuse of the Seanchan and their vassals. One of the legs of the White Tower's Accepted test is apparently designed to invert this trope. The women taking the test are shown an ideal future where they're not part of the White Tower but have to decide to abandon it in favor of staying. Averted in The Pendragon Adventure, where part of Bobby's quest in the third book involves talking to a contact from the year 5010, which is a nice time to live. Played straight later on, when Saint Dane's meddling changes timelines in multiple territories. In Obsidian Mirror, Sarah is from one. She travels back in time to try and prevent it. The Buffy the Vampire Slayer serial novel, The Lost Slayer had Buffy make a tactical mistake trying to rescue Giles, then get sent five years into the future, to her older self's body, to see a world where Sunnydale was ruled by vampires—with Giles as their king. The Forever War: The effects of the war cause Earth to fall further and further into chaos, getting more and more Crapsack as the war drags on—every time Mandella returns to Earth from one of his deployments light years away, he becomes more and more estranged. The hero of the Belisarius Series is given a number of visions of what will happen if he fails to defeat the Malwa. They range from the horrific to the apocalyptic. The Queen of Rolitania and her army manage to escape a future filled with an Earth ruined beyond repair. A good portion of those considered "normal" are dead. Espers have ravaged the landscape with their reality-warping powers. Marauding bands of crazed Espers roam freely and often clash. Clover Lappina of Spectral Shadows gets a vision of one of these for Suburbia, and how she can be the cause of it. In TimeRiders, it's constantly referenced that in the 2070s mankind is all but wiped out by the Kosong-Ni virus. Rashim is even close to witnessing it first hand. The Time War in the Doctor Who  Expanded Universe Eighth Doctor Adventures (not to be confused with the Last Great War in the RTD TV series) is a Bad Future for the whole Doctor Who universe and the Time Lords in particular, which dominates the first half of the series before getting averted in The Ancestor Cell by Justin Richards. In Super Powereds, Alice and Mary are shown a glimpse of a possible future, where humans, Supers, and former Powereds start a Mêlée à Trois that devastates the world. What's worse, it's only three decades away. And they are the key figures who might have a chance of preventing it. In All Our Yesterdays, Em is trapped in one thanks to James, and goes back in time to avert it. "Consider Her Ways" by John Wyndham. The narrator agrees to take part in clinical trials of an hallucinogenic drug which causes dissociation from the body, and wakes up in a post-Gendercide world where society has been totally restructured into something more closely resembling an ant's nest. It's explained to her that the plague that wiped out all men in this future was caused by a mutation of a virus created to kill off brown rats. When the narrator returns to her body, she seeks out the researcher whose work caused the plague and murders him, not realizing that he had a son who did similar research and, of course, had the same name as him. Robot features a Robot War between the remains of humanity and an army of Humongous Killer Robots, while once-great cities lie in ruins on the horizon. Two are scene in the second arc of Sequinox during the team's battle with Gemini, who distrcts them by constantly clapping them into different dimensions and timelines. In one, the girls find themselves in a world where they agreed to join the Sky Queen and have razed Westbrook and the surrounding area, becoming very powerful but also very, very evil. In another, they're After the End and have to act as a militia against the entirety of the Star invasion force. At the beginning of the A Touch of Darkness from Interstitial Actual Play, a Homura from the future appears, warns her past self not to speak with Hiram Lodge, and is then dragged back through time by a clawed hand and killed. Homura isn't phased, since it happens to her a lot. The Big Finish Doctor Who audio drama The Mutant Phase has a similar event to the Day of the Daleks, a Stable Time Loop causing an alternate future where the Daleks are mutating into creatures even more dangerous then them. At the end of the primary phase of The Hitchhiker's Guide to the Galaxy, Ford Prefect tells the Golgafrinchams (with whom he and Arthur Dent have landed in prehistoric days) that their days as the human race will be numbered in 2 million years when the Vogons destroy Earth. Bleak Expectations: An unusual one, caused deliberately by the heroes. At the end of series 4, Pip Bin sides with Mr. Benevolent in taking over the world, which lasts for decades, until mankind collectively gets fed up with them and decide they'd rather risk total annihilation than live under Pip and Gently's rule. It takes divine intervention (and a What the Hell, Hero? from God Himself) for Pip to go back and prevent it. Rifts is this to prequel game Beyond the Supernatural, which is set in the present day. Victor Lazlo, a parapsychologist who got time-shifted from the 1970's to this future is horrified when he meets, and is recognized by, an old friend (who was secretly a dragon) and realizes that this is his world's future, and not just an alternate one. Sentinels of the Multiverse has a few plot points involving the Bad Future. Visionary came from the Bad Future to the past in order to prevent it, while Iron Legacy (from another, separate future) is what Legacy would become if Young Legacy was killed by Baron Blade. Chrono-Ranger was just a lawman from 1883 who was sent to a third, distant Bad Future where humanity was wiped out whose goal is to time travel and kill the monsters of the past before they take over the future. The last one is the only ine that is actually a bad future of this specific timeline. The others were alternate timelines. However, since chrono-ranger has been altering the past this one is also quickly becoming an alternate timeline. Harry Potter And The Cursed Child, Albus and Scorpio use a time turner to save Cedric's life, as Cedric's father begs them. Unfortunately they cause him so much humiliation in the process that he joins the Death Eaters and kills Neville, so no one kills Nagini, Voldermort kills Harry and Take Over the World.. Clock Zero has one, as a direct result of an alternate Nadeshiko getting into a coma from a car "accident" and alternate Takato going through extreme lengths to save her and prevent the same thing from happening to her again, even if it means he has to commit downright ruthless acts in doing so. King's attempts of preventing the aforementioned incident from happening kickstarts the VN's plot. In Higurashi: When They Cry, the first episode of the second season features a destroyed Hinamizawa, an aging Oishii going back there to find out what went wrong accompanied by a grieving, regretful Akasaka and a broken, nigh catatonic, middle- aged Rena. In a series with plenty of Bad Endings, the third arc of Umineko: When They Cry leads to a Bad Future that is inextricably tied to the fourth arc thanks to the miracle of Time Travel (or maybe not). By the end of the series, it's clear that this particular future is in fact the future in this series, with no way to avoid it happening. Despite everything that happens, though, there is an undercurrent of happiness at the end. Steins;Gate has two: time travel research by CERN leads to them using time travel to take over the world and establishing a communist dystopia. The protagonists' actions prevents this and inadvertently causes every country in the world to race to become the first with a working time machine, which touches off a hellish World War III that kills 5.7 billion people. For Time players, this is the result of not keeping Stable Time Loops Stable, since any divergence from the main "Alpha" timelinenote (not to be confused with the Alpha universe or the Alpha session) will inevitably result in the timeline in question being destroyed and everyone in it dying along with everything else. John, however, recently obtained the power to alter events in canon without dooming a give timeline. All of the prior examples are overshadowed by the Game Over Timeline, the mother of all Bad Futures. This timeline pretty much makes every other doomed timeline look like a walk in the park. There are prior clues that the timeline is going down the drain, such as Gamzee going unpunished for his crimes, Terezi entering an abusive relationship with Gamzee, and Rose developing an alcohol addiction. But even in light of these clues, what is probably the biggest Wham Episode in Homestuck, the aptly-named [S]GAME OVER, is still unexpected. Jane and Jade become Brainwashed and Crazy, several planets are smashed together and set entirely on fire, Dirk commits suicide, and every single one of the heroes except John and Roxy die. The cause? Terezi trying to save everyone's life by killing Vriska before she could accidentally lead Bec Noir to their hideout. The faults in the timeline run so deep that John has to rewrite three years of his and his friends' lives via Butterfly of Doom to Set Right What Once Went Wrong. There's a future in which superintelligent dinosaurs rule the world and most of the characters are either dead or part of La Résistance. Chuck Goodrich came to the past the first time around to prevent the Zombie Apocalypse, but instead ended up branching the universe into a split timeline where another Chuck Goodrich comes to the past to prevent his own future, and so on. Because if the zombies don't destroy the future, the robotic vacuum cleaners will, and if they don't, then the superintelligent dinosaurs will. This seems to be a constant of all timelines, with each subsequent Chuck Goodrich (and it's always Chuck Goodrich) only diverting from one potential bad timeline to the next. This includes King Radical, whose goal is to save his kingdom from the Bad Future where Sparklelord destroyed everything. In Powerpuff Girls Doujinshi, there's at least one timeline where Megaville and everyone in it are slaughtered due to one of the heroes performing a FaceHeel Turn. Said timeline is explored in a spinoff to its sister comic, Grim Tales from Down Below. Seeing one of these with her as the cause is what starts off Kendra's FaceHeel Turn in To Prevent World Peace. In said future Kendra would lead other Magical Girls to destoy all villains and then Take Over the World, supposedly for its own good. Girl Genius has one of these, through not in the main comic, but on Othars twitter. Apparently in this future Lucerezia manages to take over Agathas body for good and marries mind-controlled Klaus, gaining control over Europa. Many years later Europa is completely deserted, with only a handful of survivors hiding in the remote corners of the continent. The Dark Future story in Deviant Universe where an evil AI all but destroys all life on Earth. In Luminary Children, Earth is in poverty and the galaxy is ruled by a corrupt government that hunts down kids. In Wayfarer 1805, would-be writer "Tussel" Lee learns she's somehow responsible for three different bad futures: one in which Earth is fighting a losing war against an Alien Invasion, one in which it's been subjugated by an all-knowing moon-sized supercomputer, and one in which the planet is slowly freezing to death in a new ice age. This news doesn't bother her as much as the fact that she doesn't finish the novel she's working on in any of them. The SCP Foundation developed a time machine labeled SCP-2003 and learned that in January 2349 humanity gets wiped out by an asteroid. They then begin to desperately ensure that this takes place because every possible future they encountered managed to be even worse, excluding one with a depopulated but more advanced human race that they're still investigating. New Vindicators has several of these. First, there's the future of Hikari's alternate dimension-where Apocatasis wins and rules most of the world. Then, there's the one where Jason Lamperouge has manipulated most of the heroes and villains in one way or another and culminates in the death of most of the Vindicators, Jason himself, and a few others dimension hopping and unable to get back. Lastly, there's the far future where Sol Invictus, an immortal Neo-Sapien, rules over an empire with his family, the Pantheon, as god kings. Humans are treated as second class citizens, and by the time Sol Invictus is eventually stopped, most of the heroes are dead as well. One of The Angry Video Game Nerd christmas episodes parodies A Christmas Carol by having the Ghosts of the Past, Present and Future Christmas show the Nerd his never ending cycle of getting tortured by bad games, beginning with his childhood. The last ghost (which turns out to be Dracula from Simon's Quests) shows the Nerd a bad future in which he continued to complain about games all the way up to the Wii, even starting to enjoy it. The Onion's Future News From the Year 2137 . Wyoming nuked itself by popular referendum after gay marriage was legalized, there is one Palestinian and one Israeli left on Earth in the Gaza Scrap, and the United States is building a particle accelerator to create a black hole in the Earth to end everyone's suffering. Zesty Lewis: Meanwhile, criticalism is piling up near the president, who was voted into office for a sixth time primarily because he promised to kill us all. Lewis: President's Wilsons approval ratings have gone down steadily since the delays, excepting a small rise when he personally murdered 7,000 people with a hatchet. The Nostalgia Critic's review of The Room features one ruled by seahorses. Played with in Dragon Ball Z Abridged. The future where the Androids conquer the Earth is just as horrible as it was in canon, but Future Gohan doesn't consider it to be the "bad" future. His friends were constantly dying all around him long before the Androids ever showed up, so to him, it's just "the future." Other than that, it's pretty much the same, except Yamcha, rather than being killed by the Androids, hangs himself when he finds out Trunks' father is Vegeta. In "10 EPIC BATTLES that Changed History FOREVER!" by Matthew Santoro, Matthew returns from the future only to be freaked out by the fact that the future was taken over by robots. Society of Virtue parodies it in the episode Undesired Days Of Future Past and plays it straight in Season Finale. Well, we just got back in our Time Machine and, hahahaha, you guys are so boned. Oh yes, especially you.